Back by popular demand after a sold-out 2018 series! 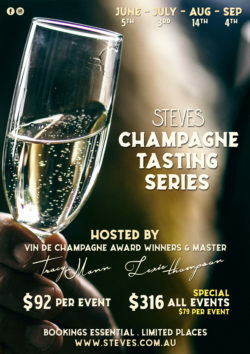 Join us at Steves as we delve deeper into the fascinating world of Champagne through a series of exclusive tasting events designed to further your knowledge and broaden your palate. $92 pp | Bookings essential. Want to lock-in all 4 tasting events? We begin an exploration of Champagne diversity with an overview of the different sub-regions of Champagne. Wines from the Montagne de Reims, Vallée de la Marne, Côte des Blancs and the Aube region will all be showcased. We will look at what makes these places unique, how geology and aspect influence the wines made in each place, and how these wines all contribute to the dazzling array of wines from the Champagne region. Hosted by Champagne Bureau Australia, Vin de Champagne Award winners and Champagne Masters, Tracy Mann and Lexie Thompson ~ This is not one to miss!